Dogs don’t eat dogs. At least normal, healthy dogs don’t eat dogs. So, if anyone tells you “It’s a dog-eat-dog world,” smile submissively and slowly back away – you are dealing with a sociopath. The world is, on the whole, a symbiotic dog-help-dog world. Why, even dogs help dogs! Nitrogen-fixing plants are one example of the general pattern of symbiosis. Plants release an average of 40% of their photosynthates (the products of photosynthesis) out their roots. They don’t do this out of inherent inefficiency. These chemical compounds are doing tasks such as sending signals to call in mycorrhizal fungi and feed those fungi, to share with beneficial nitrogen-fixing and other bacteria, or to make soil nutrients more soluble and available for uptake by the roots. Among woody nitrogen-fixing plants, there are two varieties: those associating with the bacteria Rhizobia; and those associating with the topic of this article, the actinomycetes Frankia. Actinomycetes are a type of bacteria that grow in long chains of filaments resembling the hyphae, or hair-like roots, of fungi. 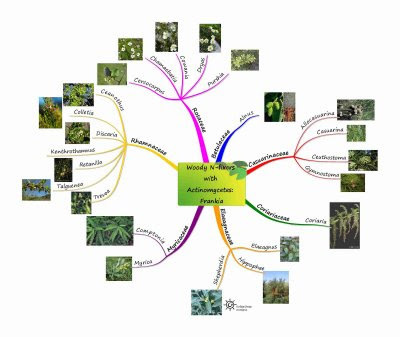 Among the woody nitrogen-fixers in temperate regions, actinorhizal plants are an important group. These pioneering plants are able to grow in poor soils, enriching them with nitrogen and organic matter. This makes them very valuable in repairing disturbed or damaged soils. The diagram below shows the 7 families of woody actinorhizal plants and their 23 genera (I left out the one herbaceous family, the Datiscaceae in the diagram, but it’s in the table). To rapidly revegetate a damaged landscape, be sure to include plenty of these species to help quickly build up the soils. In areas of very problematic soil, such as arid, tropical and subtropical regions, make 90% of your initial planting of trees nitrogen fixing, pioneer species (associating with either Frankia or Rhizobium), and 10% of species your long-term canopy overstory species. When the system reaches maturity, the proportions will be reversed with 10% nitrogen-fixing, support species and 90% canopy species. The same formula could be followed for temperate regions, but the soils in these area are not so fragile and can stand a lower percentage of nitrogen fixers. A 70/30 or even lower may suffice in these areas, as the seasonal cycles of death and regrowth feed these soils well.